The simulation exercise was held on Monday – February 11, 2019 at Kigali International Airport. It includes putting out fire of the burning airplane, evacuating passengers in crushed plane and giving first aid to patients. The Rwanda Civil Aviation Authority performed yesterday, an AEEA (Aerodrome Emergency Exercise Alpha) at Kigali International Airport, the Rwanda's gateway. The exercise began at 8.30 a.m and ended at 12.00 a.m. The goal of this exercise is to evaluate the capacity and the preparedness of the various unit involved in Fire Fighting and Rescue Departement, according to the Rwanda CAA. Participants involved in this exercise were Airline operators, Akagera Aviation, Airport Fire Fighting and Rescue Departement, Air Traffic Control, Airport Management, Rwanda National Police and Defences Forces, Kanombe & King Faycal Hospitals, Ministry of Health and of Disaster Management and Refugees, The Red Cross, Horizon and the Immigration Administration. A plance carrying 70 passengers makes an emergency landing at Kigali. Among 70 passengers, 17 are killed and 38 are seriously injured of which 15 acquire severe burns. Futhermore, 5 airplanes are requesting the permission to land, while an VIP is about to take off. This kind of emergency exercise is a Civil Aviation requirement from the ICAO (the UN's agency for the aviation) is supposed to be done once every two years. 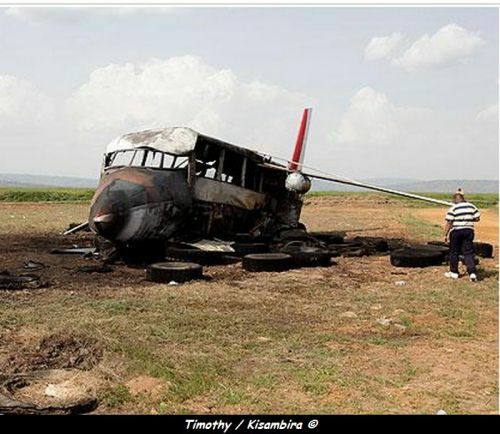 No damages on the Gisenyi Airport (Rwanda), but avoid non essential journeys along the border.